At Computex last week, ASRock demonstrated two motherboards designed for AMD’s upcoming ThreadRipper HEDT processors. The new platforms are for high-end workstations and designed to support up to four graphics cards though the 60 PCIe lanes from the CPU, over a dozen of storage devices and up to eight DIMMs. 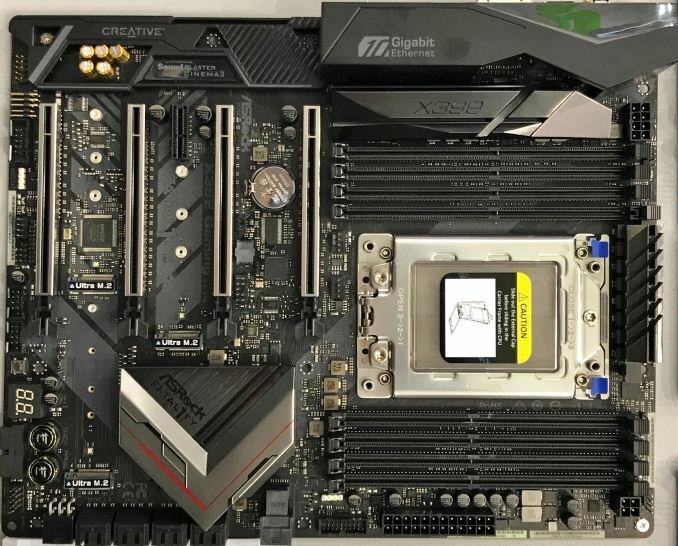 To a large degree, ASRock’s motherboards reflect overall positioning of the AMD X399 “ThreadRipper” platform as a premium high-end desktop play, and what to generally expect from makers of mainboards here. ASRock plans to offer two motherboards for AMD’s ThreadRipper CPUs: the X399 Professional Gaming and the X399 Taichi. The mainboards are based on the same PCB (and the same AMD X399 chipset/socket), but have a slightly different feature set. The ThreadRipper motherboards that ASRock demonstrated at Computex featured an eight-phase digital CPU VRM, which is the feasible limit given the physical space available, but we have no idea the capabilities of the power delivery as of yet. ThreadRipper is meant to be a high performance, high power processor, so undoubtedly the motherboard vendors have built their boards to match. When it comes to the socket itself, it has 4094 pins and is very large (not surprising given its origin). We've seen the socket referred to as SP3r2 and TR4, although the official word from AMD is that it is the 'X399 platform'. It will be interesting to see whether any motherboard maker manages to design a Mini-ITX mainboard for the ThreadRipper, but we will see. As we understand it, one of the problems with the socket, apart from the dimensions, is its cost to manufacturers that is prohibitively high at this time. 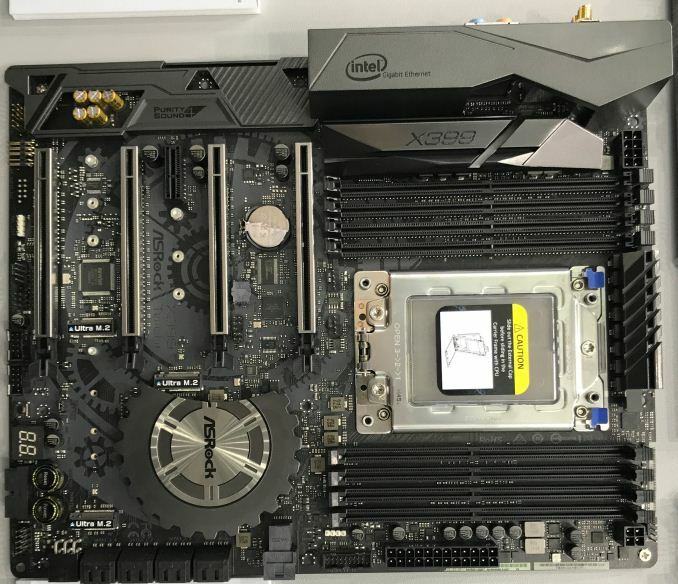 Both of the X399 motherboards from ASRock have eight DDR4 memory slots, but the manufacturer does not disclose speeds, ECC support and other details (although given previous discussions, we expect at least ECC and DDR4-2400). In fact, it does not even reveal the maximum amount of memory supported by the CPU. Though even if the company does know, it's almost certain that AMD wants to hold all of these cards close to their chest for future product announcements. The X399 Professional Gaming physically has four PCIe 3.0 x16 slots (electrically set at two x16 and two x8) that can support up to four-way AMD CrossFireX or NVIDIA SLI multi-GPU configurations, as well as PCIe SSDs. In addition, there is a PCIe 3.0 x1 slot. 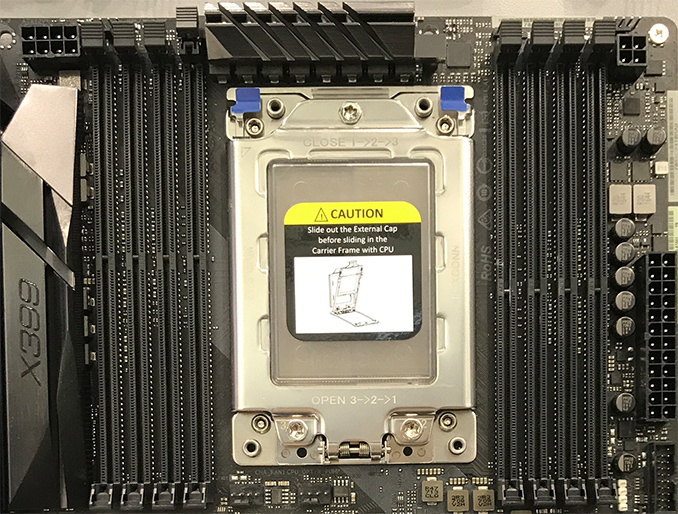 As for storage options, ASRock has most configurations covered: the motherboard carries eight SATA ports, a U.2 connector, as well as three M.2 slots. To ensure that there is enough power for the latter, there is a 6-pin PCIe power connector right near the SATA ports. As for network connectivity, the motherboard features a 10 GbE port using Aquantia's AQC solution, two GbE headers (enabled by Intel controllers), as well as a 2x2 802.11 Wi-Fi module with Bluetooth. As for USB, there are 10 USB 3.0 ports in addition to two USB 3.1 ports (Type-A and Type-C) on the back panel. Finally, the X399 Professional Gaming has a 7.1 audio sub-system enhanced using Creative Labs’ SoundBlaster software. It is worth nothing that we expect the X399 chipset to be as capable as the AM4 X370 platform, which means that some of the features on the motherboard are likely to have shared resources, meaning having one enabled will disable some others. AMD has engineered the CPU to have 60 PCIe lanes for storage and graphics, which will nominally mean most configurations will allow three GPUs (totalling 48 lanes) and three M.2 slots (totalling 12 lanes) although the 10GbE controller will require some lanes as well as the other Ethernet and perhaps a USB port controller or two. Until we see the chipset diagram, it will be hard to tell at this point. The ASRock X399 Professional Gaming and the X399 Taichi will be available later this year when AMD releases its ThreadRipper CPUs. It goes without saying that the motherboards are not going to be cheap: they are not designed for general consumers and their server origin will have a direct impact on pricing.